During the 1950s and 60s, puppets seemed particularly popular; many children’s television programmes featured string puppets, and their somewhat wobbly, jerky action added to their charm. Glove puppets and ventriloquist’s dummies also appeared on many shows. Today’s more sophisticated audiences tend to be presented with computer-animated or stop-motion films, and the string puppet is now a poor relative. In the puppet heyday, Muffin the Mule, Andy Pandy, Bill and Ben, Twizzle, Pinky and Perky, were kings of the small screen. And of course, there was the classic Thunderbirds programme which broke new ground at the time, quickly becoming a cult programme and which is now the most fondly remembered of all Gerry Anderson’s creations. No one cared that the strings could be seen, or that character’s mouths snapped open and shut like trapdoors. If a puppeteer’s hand happened to come into camera shot, well, it was all part of the fun. String puppets featured in films, too – remember Pinocchio? He was a puppet, until he realised, ‘I’ve got no strings to tie me down, to make me smile, to make me frown.’ The Sound of Music featured an enchanting puppet scene, when Julie Andrews sang the story of the ‘Lonely Goatherd’, complete with yodels, and in the Elvis film, GI Blues, puppets danced as he sang of the lack of a wooden heart. 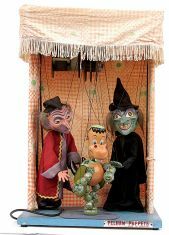 Puppet theatre is probably one of the earliest forms of entertainment; the Ancient Greeks gathered to watch puppets enact stories. They appear in most cultures, and often were intended for adults, not children. They were used to act out religious laws, and took part in ceremonies, parades and celebrations. In the Middle Ages in England, travelling puppet theatres entertained the masses with plays, often with a spiritual theme. Later, puppets such as Punch and Judy, which were originally satirical characters aimed at adults, were ‘re-invented’ to entertain children on holiday beaches. So puppets have a long pedigree. 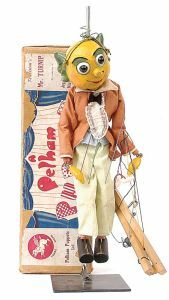 Pelham Puppets were the brainchild of Robert Pelham, making their first appearance in 1947, and remaining in production till 1993. After the war, Robert, or ‘Bob’ formed a company, ‘Wonkey Toys’, in Marlborough, Wiltshire, employing ex-service personnel to make novelty wooden toys. He must have been an enterprising and resourceful man, as he managed to source much of his material from government surplus stores and junk yards. When the company turned their attentions to puppets, these were initially made from odds and ends too. Early puppets included Sandy McBoozle (Scotsman), Cowboy, Cowgirl, Witch, Lulabelle (hula girl), Ice-Skater and Clown. Originally the puppets had their wooden heads turned on a lathe, but after visiting a fairground in 1948, Bob secured a supply of the wooden balls used for coconut shies, and so often these were used for the h eads of puppets. The excellent book by David Leech, ‘Collecting Pelham Puppets’, includes Bob’s description of ‘how it all began’, where he describes how he used large wooden toggles for puppets’ boots, partitions from ammunition boxes for bodies, the end plywood panels of the boxes for the control strips, and flexible rubber gasmask hoses to form legs on large display puppets. 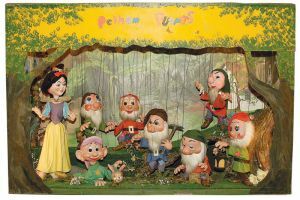 Many people remember the wonderful Pelham Puppet displays which brightened toy stores in the 1950s and 60s. These large ‘theatres’ were capable of displaying several puppets at once, and the puppets’ actions not only attracted the crowds, they were a vital and innovative point of sale. Later, mini displays were made to fit on a small shop counter. Millions of puppets must have been produced by Pelham over the years; it seems that there is no definitive list of the various characters which were made, so no-one knows for sure, especially with the early puppets which often included experimental designs and short runs. Some of the more popular designs were in production for decades, so collectors date them by various means – joint style, head shape, string colour. 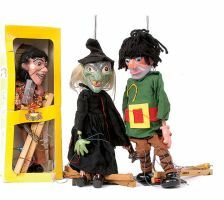 One of the delights of collecting Pelham Puppets is that because many of the characters are favourites from children’s television, comics and books, it is possible to relive your childhood. Early television-related puppets include Mr. Turnip, Hank, Bengo, Andy Pandy, Muffin the Mule, Bleep, Booster and Torchy. Lettice Leefe (the greenest girl in the school), a favourite bespectacled schoolgirl in a gym-slip character from Girl comic, appeared in 1953, but is rare to find nowadays. In the early fifties, Bob acquired the rights which allowed him to produce Walt Disney puppets; Snow White, Pinocchio, Cinderella, Donald Duck and Minnie Mouse were amongst those which appeared. He even made all seven of Snow White’s dwarfs. As puppets have strings which tend to tangle, children often used to replace them in the boxes after use, as opposed to the boxes of dolls and other toys which were normally quickly discarded. This means that collectors have a good chance of finding boxed items. Puppets can be dated form the boxes – assuming, of course, that the original owner replaced them correctly. Brown boxes with a dark blue and white label (or other colours) date from the fifties. In the sixties the boxes were yellow and adorned with pictures of various puppets from the range. By the end of that decade, the boxes had cellophane fronts so that the puppet could be seen inside. Yellow cello-fronted boxes continued throughout the seventies, reinforced with a band of card across the front. The late eighties saw a change to red and yellow striped boxes. Collectors usually prefer the puppets to be in good condition, with not many chips. Strings should be untangled. Generally, as with most collectables, the older puppets are more desirable. However, some of the later puppets are rare, as not so many were made, and there are also ‘specials’ which were produced over t he years. Really rare puppets are becoming more and more valuable; a 1940’s clown wearing a camouflage suit made £1,350 at auction a few years ago. 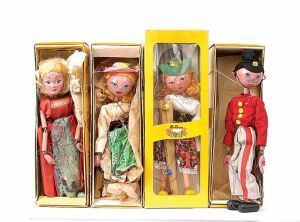 At the height of their fame, during the 1950s, 60s and 70s, it seemed that most British children either owned a Pelham Puppet, or knew someone who did! Now collectors are discovering the puppets, and making them feel wanted again.